We’d love your help. Let us know what’s wrong with this preview of The Crucible of Doubt by Terryl L. Givens. To ask other readers questions about The Crucible of Doubt, please sign up. Although I am LDS, I love Givens' style of not being a church apologist and his questioning nature. What other LDS authors have this same style? I honestly wish that this book would become its own Sunday school class in my church. I wish that there were a class at BYU that was focused purely on the ideas in this book. I wish that all my friends and family would read it. There are a lot of books that I give 5 stars to which I have recommended to people. This is because I felt like they told amazing stories, were extremely well written, or moved me in some way. This book is different. I highly recommend it because I feel that it is importa I honestly wish that this book would become its own Sunday school class in my church. I wish that there were a class at BYU that was focused purely on the ideas in this book. I wish that all my friends and family would read it. There are a lot of books that I give 5 stars to which I have recommended to people. This is because I felt like they told amazing stories, were extremely well written, or moved me in some way. This book is different. I highly recommend it because I feel that it is important. I could be getting ahead of myself here, and maybe others would read this and not have it be as influential, but for me, its message is critical. I was raised a Mormon and to this day have remained a Mormon. So much of my life is shaped and influenced by my faith. Over the last couple of years, my perspective on religion, Mormonism in particular, has shifted. I have seen this shift in a lot of people around me and have heard others characterize this transition as a ‘faith crisis’ but that sounds slightly too dramatic to me – at least for my experience. I served an LDS mission for my church in West Virginia back in 2005-2007 and during that time I was exposed, for the first time, to many different views on life and religion. I was also exposed, by competing religions, to ‘accusations’ about Mormon history and doctrine. I was told things about Joseph Smith and Brigham Young relating to polygamy or racism and I either justified or denied it. After my mission, I slowly heard other things about the church that I hadn’t heard before. Again, my typical response was that it was ‘anti-Mormon’ literature and thus deserved none of my attention. The hard part for me is that I am a researcher at heart. My wife can attest, whenever we buy something new or are planning a trip, I try to learn as much as I can about the topic or place. I don’t like not-knowing something about something that I may spend money on. Similarly, in my profession as a statistician, I am constantly required to read journal papers from other statisticians’ work to see what has been done before and how it applies to my job. I have to compare different viewpoints and come to a conclusion myself. I have found great value in this process. Interestingly enough, I never took this research mentality to my own church’s history and theology – despite the fact that my faith is so central to my life. In recent years, that has changed. Over the last 5-6 months particularly, I have learned a lot more about church history in particular. I am no expert but so far I must say that there are a lot of things that don’t jive with me. I don’t understand polygamy and it is hard for me to see how that was a good thing. I think many past Mormon leaders made very racist comments and actions. There are parts of current Mormon theology regarding marriage/polygamy in the afterlife that still don’t sit well with me. Sometimes I question Mormon historical claims. Also, culturally, there are some parts of the gospel that rub me the wrong way. With all this being said, for every one hard thing that is hard for me to grasp, there are 5-10 things that I love and embrace. I love the focus on family life. I love the encouragement for me to live worthy and honor my priesthood. I love having general conference twice a year to be reminded of the important things in life. I love the theology of eternal families. I like the home teaching program and the primary program. I like the warm feelings I get during my own personal study or at the temple. I love the people in the church that I have met. I love how the gospel has shaped my life and I hope it shapes my kids life. Deep down, I believe that it is an incredible thing and I feel grateful that it is a part of me. This brings me (finally ☺ ) to the book review. This book touched on so many important ‘difficult’ aspects of the church and provided a way to think about it in a new way. It didn’t feel cheap or apologetic (I am not saying Mormon apologetics are bad, but often they don’t feel honest to me) but instead felt honest and right. I loved its perspective on doubt in general and how it can purify us and bring us to a better place. I feel like it has done that for me. I am not saying that taking my approach to the gospel is the right way, but I feel like it has been right for me. There are many close to me that I love that have no interest in facing difficult aspects of the church and I have no problem with that. I just wish there was less fear regarding more challenging parts of the gospel and that instead of putting up a wall of anger/rationalization that instead we could see it for what it is – reality, which always seems to fluctuate between the hard and difficult to the amazing and beautiful. I first encountered Terryl Givens when he spoke at BYU. At the end of his talk he said, "But [Joseph Smith's] message also flamed forth because millions of men and women have freely chosen to believe. They assayed the opinions of doubters, and they gave a hearing to the critics. Like Brigham Young, they knew Joseph was human and subject to err, but they sampled his words and agreed they tasted like honey. They weighed the beauty of a god and of human origins and a human future unlike anything be I first encountered Terryl Givens when he spoke at BYU. At the end of his talk he said, "But [Joseph Smith's] message also flamed forth because millions of men and women have freely chosen to believe. They assayed the opinions of doubters, and they gave a hearing to the critics. Like Brigham Young, they knew Joseph was human and subject to err, but they sampled his words and agreed they tasted like honey. They weighed the beauty of a god and of human origins and a human future unlike anything before imagined. They found reason to doubt, and they found reason to believe. They chose to believe." This described me perfectly. I do find reasons to doubt (some very good reasons) and I also find reasons to believe (some very powerful reasons), and like those followers before me, I chose to believe. This review is going to get a little personal, but this book helped me so much. I have such a great respect for the Givens. I attended college at BYU-Idaho and had the opportunity to listen to Terrel speak at an English Pre-professional conference. I wish the self that I am now could go and speak to him at that conference and tell him what an impact this book had on me. I've been dealing with what you could call a faith crisis for about two years now and got to the point where I was considering l This review is going to get a little personal, but this book helped me so much. I have such a great respect for the Givens. I attended college at BYU-Idaho and had the opportunity to listen to Terrel speak at an English Pre-professional conference. I wish the self that I am now could go and speak to him at that conference and tell him what an impact this book had on me. I've been dealing with what you could call a faith crisis for about two years now and got to the point where I was considering leaving the Latter-day Saint church all together due to unanswered questions, doctrinal inconsistencies, problematic history, and treatment of LGBT issues. However, even with all my concerns with the church, I feel like I can continue to stay an active member of the church. I think there can sometimes be an attitude in Mormon culture that if you don't agree or know everything in the church is absolutely true, then you don't belong. However, that is simply not true. I love how at the top of the cover of the book it states, "The body of Christ needs its full complement of members--the devout, the wayward, the uncomfortable, the struggling." I would recommend this book to any Latter-day Saint who is struggling with their faith. 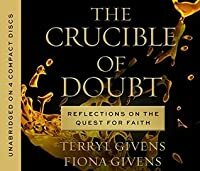 Terryl and Fiona Givens eloquently tackle tough issues that some people have with the church and give thought out answers that are honest and fulfilling. While this book does not solve all the questions that some may have about the church, it does give the reader a different way of looking at things. I found this book to be extremely helpful in a time where I needed it so much. This is possibly the best book on LDS belief that I've read, outside of the canon and the writings of modern apostles and prophets. It offers some very important perspectives and reminders—for believers, doubters, and everyone in between. I had one small beef with the book, and that was from the last chapter. In the setup the Givenses give overviews of contrasting cosmologies: a godless, "scientific" cosmology; a non-LDS Christian one; and then the LDS perspective. I found the first two overviews This is possibly the best book on LDS belief that I've read, outside of the canon and the writings of modern apostles and prophets. It offers some very important perspectives and reminders—for believers, doubters, and everyone in between. I had one small beef with the book, and that was from the last chapter. In the setup the Givenses give overviews of contrasting cosmologies: a godless, "scientific" cosmology; a non-LDS Christian one; and then the LDS perspective. I found the first two overviews to be reductionist and even dismissive. This treatment and the accompanying tone didn't really fit with the rest of the book, and it didn't belong there. Loved it. What a great book for our times. I will be revisiting this book as I continue to grow my faith. I think every person should read this book, because if you're not going through a faith crisis yourself, someone near and dear to you probably is going through such a crisis. I just loved that it was a book of truth. It didn't attack the church in any way, it just presented truths and presented things I didn't know. Church is a place of a growth and development and honesty. Loved, loved, love Loved it. What a great book for our times. I will be revisiting this book as I continue to grow my faith. I think every person should read this book, because if you're not going through a faith crisis yourself, someone near and dear to you probably is going through such a crisis. Loved, loved, loved the chapters on the use and abuse of scriptures, the role and the function of the church, and find your watering place. But let's be honest, I loved the entire thing. Loved this quote "Abandoning our faith because it doesn't answer all the questions would be like closing the shutters because we can't see the entire mountain." An insightful little book that could bring about big change in a struggling believer. The authors have a real gift for speaking reasonably to skeptics about faith positions. The wide net of propositions the authors cast is a virtue but I would have liked to see a little more elaboration on some of their ideas. Still, some really great stuff worth revisiting. After finishing this book the first time, I began to write my review, but found myself having to research and dig deeper. I eventually read it a again, taking notes and pondering as I went. These notes, made mainly for my personal use, are below. I go chapter by chapter, summarizing, writing explanations to myself, and repeating quotes that carried special meaning to me. Seldom has a book resonated with me on so many points. Not only was I ready to agree with and understand so many insights, but After finishing this book the first time, I began to write my review, but found myself having to research and dig deeper. I eventually read it a again, taking notes and pondering as I went. These notes, made mainly for my personal use, are below. I go chapter by chapter, summarizing, writing explanations to myself, and repeating quotes that carried special meaning to me. Seldom has a book resonated with me on so many points. Not only was I ready to agree with and understand so many insights, but I was then taken to the next level through reason and humility. I didn't know it was possible to think this way and come to these conclusions based on simple truths that I already knew. I recommend this book to everyone. But buckle up and be ready to do some serious self-introspection as you must examine what truths you believe and what truths you want to believe. "the best art penetrates the hard shell of habit to reimmerse us in the depths of experience, “refining the sense of beauty to agony,” “ making the stone more stony,” creating “anew the universe, after it has been annihilated in our minds by the recurrence of impressions blunted by reiteration." "Can any claim be more specious than to suggest that we want more objectivity, and less emotion, in guiding the course of our personal and collective lives? Emotion is not a defect in an otherwise perfect reasoning machine." "In each of the examples mentioned, the artist’s depiction of human emotion, informed by moral conscience, is shown to be one of the greatest mechanisms in civilization’s arsenal against the evils of this or any time." Love is a lens that lets us see the world outside ourselves, the world closer to reality. "In the most emphatic and urgent meaning of the word, love reveals truth. It does not create the impression of truth; love does not merely endow something with a subjective truth—love is the only position or emotional disposition from which we become fully aware of the already present reality of the other person as more than a mere object among other objects in a crowded universe. Love alone reveals the full reality and value of the other person." Science can inform us of the "whats" but not the "whys". None of us live our lives according to reason or logic. We may find logical reasons for the way we live our lives, but they don't supply why. "Art, moral sense, and love" are all "proofs that different ways of knowing exist." We look to religion to resolve ambiguity. But Christianity is inseparable from provocation. The peace the gospel brings comes as help amid the storms of life, rather than an escape from them. "The circumstances that define the reality of the human predicament are not a blatant choice between Good and Evil but a wrenching decision to be made between competing sets of Good." True religion offers no short cuts or easy answers, only the truth that there are none, that progress is a painful road. This leaves us in suspense, which we abhor. "Freedom to choose belief and a life of faith, freedom to choose one’s principles and abide by them, freedom to cherish one set of values over another, those kinds of freedom might best unfold when we are not commanded in all things, by God or by the facts. To be an agent unto oneself may very well require that we operate in the valley of incertitude. It is here that we act most authentically, calling upon intuition, spiritual intimations, or simple yearning." "Such self-revelation is a painful - but ultimately healing - process. This perspective represents a fundamental reorientation in attitude toward life’s incompleteness. The patterns of meaning only dimly perceived, the inspiration only partially (or negligibly) felt, may not be God’s indifference after all—or our spiritual failing. It may be the most potent form of the question most worth posing: What will you do now?" Even though the gospel provides powerful ideas and explanations supported by spiritual intimations, it does not give us all the answers. We must still live, and grow, by faith. "True religion is a way of life; a church is an institution designed to strengthen people in the exercise of that life." A person's religion is the end to which all their actions are pointed. Church is an opportunity to serve and practice being like the Savior. "the purposes for which we go to church should be to reenact, in microcosm, the motivations and objectives that Jesus had in laying down His life for us." "But what if we saw lessons and talks as connections to the sacrament rather than as unrelated secondary activities? What if we saw them as opportunities to bear with one another in all our infirmities and ineptitude? What if we saw the mediocre talk, the overbearing counselor, the lesson read straight from the manual, as a lay member's equivalent of the widow's mite? A humble offering, perhaps, but one to be measured in terms of the capacity of the giver rather than in the value received. And if the effort itself is negligible - well, then the gift is the opportunity given us to exercise patience and mercy." Learning to live in harmony and unity with others is core to religion. Hence families, and hence wards. "It would be hard to overestimate the impact this physical boundedness has on the shaping of Mormon culture. Like the family into which one is born, wards become the inescapable condition of a Mormon’s social and spiritual life." Most of us are shown by life that we cannot find true happiness on our own. The sacrament is a symbol of Christ's willingness to suffer with and for us. We complete the ritual by committing to give up our favorite sins. Heaven cannot be understood simply as a place. In essence, it is defined by the quality of the relationships we have been able to build. Ordinances may be arbitrary, but as such, they allow us to start a personal relationship with God. No moral imperative dictates the action, is is purely a sign of faith and a willingness to obey. "In this light and context, the seeming arbitrariness of gospel ordinances becomes the very ground on which the particularism of a specific, personal relationship with the Divine becomes enacted. Ordinances make possible our response to God's invitation. We are enabled to formalize and constitute a living, dynamic relationship through a set of ritual performances." We need to search the scriptures in the company of the Holy Ghost. Reading them merely is insufficient to reveal the portions that most truly testify of Christ and His Father. Scripture comes through fallible humans and his therefore subject to imperfect filtering of culture, situation, personal understanding. Scripture must be taken in context (letters, poems, family history, metaphors, etc.) Be careful of scriptural literalism. It's human nature to hero worship, but the danger is in seeking to turn over the responsibility to work out our own salvation. We must keep our own conscience and know for ourselves what's right. This is not the role of prophets. Far from being perfect, church leaders aren't even necessarily the best of humanity. "Many of our expectations about human institutions are so predicated on meritocracy that we are sure God must operate the same way. The head of the corporation should be the most talented business leader. The orchestra’s concertmaster should be the most skillful violinist. The starting quarterback is the one who plays the best football. Surely the leaders of the Church should be the most righteous and flawless of humans!" "Airbrushing our leaders, past or present, is both a wrenching of the scriptural record and a form of idolatry. It generates an inaccurate paradigm that creates false expectations and disappointment. God specifically said that He called weak vessels so we wouldn’t place our faith in their strength or power, but in God’s. The prophetic mantle represents priesthood keys, not a level of holiness or infallibility." If any practices or teaching from church leaders contain errors, that's proof they aren't led by God. "Authority is the source of delegation, delegation involves humans, humans entail error, and error in the context of authority creates conflict and tension." Law can come through delegated authority and therefore be imperfect, but law still cannot change truth. Any time we receive counsel from local or general church leaders, it is our responsibility to seek confirmation from God directly, sustaining their direction with patience and faith, but keeping in mind that human vessels are fallible. If leaders are doing their best in good faith, God will support and uphold even their bad decisions, within limits. "Is this not hubris, to expect God’s sanction for a decision made in error? Perhaps. It is also possible that the reply reveals the only understanding of delegation that is viable." Tempering this tough situation is the breadth of God's mercy, as well as his ability to edify us through tribulation. "If God can transform cosmic entropy and malice alike into fire that purifies rather than destroys, how much more can He do this with the actions of well-intentioned but less-than-perfect leaders." "God said He would have a tried people. But He doesn’t have to do the trying. We do most of it to each other—through the very weakness designed to bring us all, fallible leaders and struggling disciples, to Christ the Healer." Great contextual thoughts about the priesthood ban, polygamy, the Mountain Meadows Massacre, and church history in general, along with how leaders have portrayed church history. During the time the priesthood was taken from the earth, God spoke through poets, artists and musicians. And the Catholic church safeguarded many principles of truth, such as the connection between the living and the dead and purgatory. "Joseph Smith's view is one of the most generous, liberal, and universalist conceptions of salvation in all Christendom." Do all the programs of the church create spiritual dependency? There exists a community of true believers in Christ that transcends the church. We need to be members of that community of disciples. "In Salt Lake’s old Thirteenth Ward, Bishop Edwin D. Woolley frequently found himself at odds with President Brigham Young. On a certain occasion, as they ended one such fractious encounter, Young had a final parting remark: “Now, Bishop Woolley, I guess you will go off and apostatize.” To which the bishop rejoined, “If this were your church, President Young, I would be tempted to do so. But this is just as much my church as it is yours, and why should I apostatize from my own church?”"
"But the Creator God of Genesis is a Being who revels in distinctions, difference, and variation, an Artificer who separated man from woman as surely as He severed earth from sky." "Instead of explaining our suffering, God shares it." What else could a third of our brothers and sisters revolt from during the war in heaven but the prospect of personal and collective suffering, despite the proposed good it would do us? As Saints, we are called to share in the suffering of others. This may seem counter-intuitive to the gospel of peace and happiness. "Life can be excruciating at the worst of times, and unhappy at the best. To live without God in the world, without hopes or expectations, without spiritual balm or religious faith, is trying. To live a life of discipleship and then feel hopes dashed and expectations unfulfilled, the balm ineffective and the faith devoid of fruit, is to compound the pain with devastating disappointment and heartache. False hope seems worse than none; better to know one is alone in the sea than to wait for the rescue that never comes." We are creatures of the moment. "Our present, of course, is shaped by our past. We are in many ways its product. But at the same time, we tend to reinterpret the past on the basis of the present. We are creatures of the moment, so, rather than remember, we reconstruct what once we knew in the light of present uncertainty or loss, which can all too easily overwhelm what we once held as true and real. All too often we forget the gentle impressions we felt, the calm soothing of troubled hearts and minds, or even greater manifestations of divine love." "The Lord gently tutor[s] us to replace immediacy with memory." Heavenly messages come in many different forms. "I decided to bet my entire life that the gospel was true." "I would rather die forevermore believing as Jesus believed, than live forevermore believing as those that deny Him." Absolutely, absolutely amazing. Perhaps one of the top five most impactful books I've read. This book is full of doctrine, scripture, teaching from prophets and apostles, thoughts from philosophers and writers, some poetry, and a few really powerful personal anecdotes. The point is to teach a lesson on doubting and candidly talk about the purpose of doubt. Doubt is painful and isolating in a lot of instances, but isn't necessarily the product of a lack of faith. In fact, they go so fa Incredible. I knew only pages into this book that it would broaden my perspective on an array of religious topics. I am not someone who has had to deal with doubt in terms of church doctrine but I have had some very difficult questions and concerns about my own future and the plan the Lord has for me. This book has helped me to see things very differently. I am still turning ideas over in my mind and still trying to process what I learned. I would recommend this book to anyone going through a difficult period of uncertainty or doubt. I would recommend this book to anyone with painful questions about doctrine. I would recommend this book to anyone outside of our faith who wants to know a little bit more about how Mormons approach (or try to approach) doubt and faith. I would recommend this book to anyone. ... True religion is inseparable from suffering. It tells us the truth about our condition without flinching, offers no cheap solutions, and conceals none of the costly price. And the price that extracts the most from us is not the final, definitive resolution of the arena or the operating room. It is the fretsome anxiety of the waiting room. "There is no pain so awful as the pain of suspense," said Joseph Smith. That is why we will do almost anything to escape this suspense. We feel unmoored if our religion fails to answer all our questions, if it does not resolve our anxious fears, if it does not tie up all loose ends. We want a script, and we find we stand before a blank canvas. We expect a road map, and we find we have only a compass. ...It is curious, in this regard, that so many critics attribute to religion a kind of facile wish fulfillment, imaginative fairy-tale scenarios that reduce complexity and mystery to easy answers and glib forms of consolation.... Religion is not the coward's way out of life's difficulties. ...In considering the divinely appointed contrast between things that act and things that are acted upon, it may be worth considering that freedom and its opposite take many forms. Freedom to choose belief and a life of faith, freedom to choose one's principles and abide by them, freedom to cherish one set of values over another, those kinds of freedom might best unfold when we are not commanded in all things, by God or by the facts. To be an agent unto oneself may very well require that we operate in the valley of incertitude. It is here that we act most authentically, calling upon intuition, spiritual intimations, or simple yearnings. Staying the course takes a great effort of will. Relinquishing faith would solve some problems—but would multiply others. For how does one even begin to address the manifold experiences and tender feelings we have known, the powerful ideas and explanations our theology provides, and the visitations of peace and serenity that are balm to broken hearts like our own? Abandoning our faith because it doesn’t answer all the questions would be like closing the shutters because we can’t see the entire mountain. We know in part, Paul said, looking for the flickering flame to give us a glimpse of the way ahead in the gloom. With Nephi, we readily confess: “I know that [God] loveth his children; nevertheless, I do not know the meaning of all things.”30 We know more than we think, even if we know less than we would like. We are creatures of the moment, so, rather than remember, we reconstruct what once we knew in the light of present uncertainty or loss, which can all too easily overwhelm what we once held as true and real. All too often we forget the gentle impressions we felt, the calm soothing of troubled hearts and minds, or even greater manifestations of divine love. We all have known our share of broken hearts and silent skies. We pass through our deserts, and we often labor to recall the sweet waters we have tasted along the way. Perhaps, when our faith or our desire to believe is at its lowest ebb, we might consider the meaning of those words, “blessed is he that believeth . . . without being brought to know . . . or even compelled to know, before they will believe.”5 Perhaps these words are telling us there is a type of flower that can bloom only in the desert of doubt. This book put into words many of my thoughts and feelings in a much more literary (and sometimes too flowery) way than I ever could. Mormonism is in an undeniable state of flux and transition. This book presents a utilitarian and pragmatic approach to faith within Mormonism that I think will likely become more mainstream over time, although I have to think that if Bruce R. McConkie or Joseph F. Smith were alive to read it, they would be appalled. The book draws upon ideas from within and without Mormonism. It focuses on the efficacy of faith, rather than on literalism itself. I wish every Mormon would read this book. The Givens help frame the discussion of Asking Questions, Having Doubts, not being able to say "I know this church is true", etc., in a way that allows Mormons to navigate their own faith journey in a way that is authentic. My favorite book of 2018. I definitely want to reread this one soon. And repeatedly. I think I need to read it again. These people are much smarter than I am. I need to look up all the poetry they quoted and find out what most of it meant. I underlined and underlined but think I need to read it again. Great book, interesting thoughts. Lots to ponder. "We have learned to relish a commitment that is born of faith freely chosen rather than of certainty compelled by evidence" - Terryl and Fiona Givens. 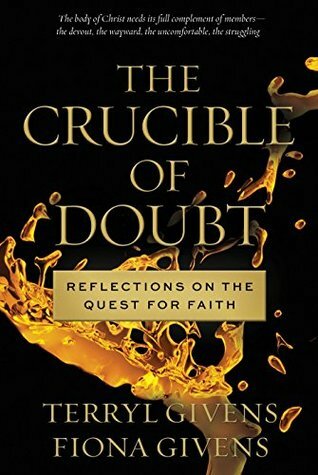 In The Crucible of Doubt, the Givens's aim is to articulate appropriate and effective ways to approach one's quest for faith, particularly for those with doubts about the truth claims of the Church of Jesus Christ of Latter-day Saints. Dispelling false assumptions about Latter-day Saint theology, history, and culture is a start. Belief is risky, the "We have learned to relish a commitment that is born of faith freely chosen rather than of certainty compelled by evidence" - Terryl and Fiona Givens. Belief is risky, they argue, but a risk worth taking, especially considering the goodness inherent in the doctrines of the Restoration. Reminiscing can be a powerful tool. "To remember is to rescue the sacred from the vacuum of oblivion...It is useful at such moments of doubt, if we can't exercise faith in God, to exercise faith in ourselves. We can trust that it was a good and trustworthy self that once knew certain things to be true--and may one day again." We also must not be dependent on the Church to spoon feed us our spirituality. "The challenge, then, and the enticing opportunity, is to find a pattern of devotion and nourishment that extends beyond the confines of a Sunday curriculum, one that constitutes our private life of discipleship. For while the established Church provides a framework of service, an occasion for community, and a vehicle for saving ordinances, it is in the secret chambers of our private temples that we must have ultimate recourse to the inspiration and revelation that guide our discipleship." I was hesitant, at first, to read this. Why? When I found out the authors were LDS, and that the book is distributed by an LDS company, AND that it was flying off the shelves faster than it can be kept in stock; my red flags all went up. Not to be misunderstood, I am a member of the LDS faith. But I also tend to steer away from what I consider to be traditional, close-minded writings of LDS authors. I'm not a fan of LDS culture, nor the media that tends to be popular among said group. Nor am I e I was hesitant, at first, to read this. Why? When I found out the authors were LDS, and that the book is distributed by an LDS company, AND that it was flying off the shelves faster than it can be kept in stock; my red flags all went up. Not to be misunderstood, I am a member of the LDS faith. But I also tend to steer away from what I consider to be traditional, close-minded writings of LDS authors. I'm not a fan of LDS culture, nor the media that tends to be popular among said group. Nor am I enticed by red-hot fads. In fact, I shy away from anything that is touted as "the latest and greatest" of anything. That being said (with far too many words). This book is anything but close-minded. I found myself nodding and tearing-up several times as I listened (on CD) to Ms. Givens recount stories and experiences of some of history's most noble souls recounting their "hour of torment." I had a friend who once wisely said, "There is tremendous solace in singing the blues." Somehow, hearing about the struggles of those possessed of a greater faith than I, has given me solace and hope. I wanted to read this book to help me better understand friends and acquaintances who seem to be experiencing crises of faith in their lives. I enjoyed every moment of this thought-provoking book! Brother and Sister Givens have a gift for eloquence and clarity in their writing that I love. There were so many points they made that made me feel like shouting, "yes that's what I think too!" But they say it all so much better than I ever could. I think one of my favorite takeaways from the book will I wanted to read this book to help me better understand friends and acquaintances who seem to be experiencing crises of faith in their lives. I enjoyed every moment of this thought-provoking book! Brother and Sister Givens have a gift for eloquence and clarity in their writing that I love. There were so many points they made that made me feel like shouting, "yes that's what I think too!" But they say it all so much better than I ever could. I think one of my favorite takeaways from the book will be the idea that we are creatures meant to live in the past, present and future all at once. That is what makes "remembering" so important to us. And in our individual quests for faith they point out that sometimes the apparent silence of heaven is not a lack of interest or answer on the part of God, but rather a tutorial in the importance of "casting our minds back" to moments of clarity we have known before. That concept is profound to me. I'll be short, but I believe the Givens give voice to a segment of Latter-Day Saints that I think is important. The Crucible of Doubt provides a moving doctrinal basis for commitment to faith and God in the face of intellectual and cultural challenges. Their perspective gives me a sense of peace in my own concerns, and confidence in the process of living a life with faith, despite the personal challenges that may entail. The Givenses do a good job of expressing--through their own meditations as well as through examples from literature, LDS history and religious history in general--some reasons why a doubter might want to stay LDS, and make a good case for there being room in the church for doubters. The book has the possibility of being food for thought for some who are considering leaving, but is potentially mind-broadening and useful for the staunchest members. Another beautiful distillation of some very confronting and difficult topics. The Givens' speak directly to my soul and do some in such a profound way I am sometimes unable to continuing reading for minutes at a time. Terryl and Fiona Givens are easily the top two minds in Mormonism today. This book would easily make my "Top 10 greatest books I've ever read list." I wish this book could become the official Sunday School text for next year. Every Mormon should read it. Phenomenal book! Fantastic. This is a book I will reread and keep near enough to reference. I'm not normally a page marker but most pages in this book have something underlined. I saw the Givens speak at Time Out For Women last year and picked up this book while there. It came along at just the right time. “Twenty years it took for her to escape the confines of her preconceptions and realize the answers were delayed because her questions were wrong” (4). “Hell was not a fixed place of retribution, but the experience of our own alienation from God. In other words, hell is the condition of suffering that results from sin” (5). “The Atonement is not a backup plan in case we fall short in the process; it is the ordained means whereby we gradually become complete and whole” (5). “Sherem came from an indigenous people or different group of settlers than the Nephite. And his was unlikely to have been the only non-Nephite or non-Lamanite group” (8). “Daniel Dennett wrote, “Philosophy…is what you have to do when you figure out what questions you should have been asking in the first place.” Disciples too must persevere until we get the questions right…We are all prisoners of our preconceptions and faulty models. Those are frequently the problem in faith crises—not the questions that arise from them. After all, the Restoration unfolded because a young man asked questions” (9). “As the seed of faith sprouts and grows, we cannot know how the branches will bend or where the roots will twist” (10). “Emotion is not a defect in an otherwise perfect reasoning machine” (15). “Our failure to find support in science, or logic, or rationality, or whatever name we want to give it, should not cause us to doubt our intuitive moral faculty. On the contrary, it should cause us to place greater trust in and value upon it” (20). “What we can “see, as it were, [is] just the white foam on the wave-crests, not the massive waves themselves” (21). “True religion is a way of life; a church is an institution designed to strengthen people in that exercise of life” (39). “A life devoted to serving others reflects the best conceivable set of values” (40). “What purpose then does the Church serve? We sometimes want it to be more, and sometimes less, than it is” (40). “But we sometimes grow frustrated with all the peripherals. Lessons and talks are to some Mormons what cafeteria food is to teenagers—not just in the way they can be bland and boring, but in the way that they sometimes bring us together in mutual griping rather than mutual edification” (42). “The word worship first appears again in conjunction with a costly offering…worship, then, is about what we are prepared to relinquish…a sacrifice” (43). “We love God by learning to love one another” (44). “Wordsworth found that the rules of sonnet making do not in fact constrain, but actually make possible, poetic form. Beauty, he found, comes with the exercise of freedom within particular bounds” (48). The canon vs cannot definitions (51). “The logic of the Reformation spearheaded by Martin Luther had depended in large measure on perceived discrepancies between Paul and James. Seeing that the Bible was not always in harmony with itself, Luther admonished his readers to “discriminate between all the books and decide which are the best” (52-53). “The question is, what do we do with these internal scriptural contradictions?...Joseph Smith said the Song of Solomon did not constitute ‘inspired writings,’ and urged his listeners to use discretion, wisdom, and inspiration in how they read the scriptures. On the other hand, one of Joseph’s revelations encouraged Latter-day Saints to study the Apocrypha, because ‘there are many things contained therein that are true’” (55). “Contradictions in the text are not contradictions in the nature of God Himself, and readers must spiritually discern for themselves the reason for the inconsistencies. As Joseph Smith said, “many things in the scriptures… do not, as they now stand, accord with the revelation of the Holy Ghost to me’” (55). “We need to search the scriptures in the company of the Holy Ghost…The reason for spiritual imperfection should be obvious: scripture comes to us through human conduits…This does not suggest a process by which a prophet invariable takes dictation as the Lord verbally recites a set of verses” (56). Joseph “studied German so he could read Luther’s superb translation of the scriptures. He studied Hebrew so he could get closer to the original text of the Old Testament. Notwithstanding his calling as a seer, he labored to understand Egyptian as he worked his way through the papyri that led to his production of the Book of Abraham…When dissonance and distress set in, we should trust to the Spirit to find the hidden God of scriptures” (57). “Heroes, it would seem, exist always, and a certain worship of them” (61). “True leaders orient disciples toward the Divine” (62). “Christ invites us to assume the yoke, but we would rather ride in the cart. That is one reason why some find comfort in hero worship. It represents a release from the burden of responsibility” (62). “Brigham Young protested the perils of slavish obedience and submission…’I wish them to know for themselves and understand for themselves.’ Elsewhere he reaffirmed: ‘I am more afraid that this people have so much confidence in their leaders that they will not inquire for themselves of God whether they are led by him. I am fearful that they settle down in a state of blind self-security, trusting their eternal destiny in the hands of their leaders with a reckless confidence that in itself would thwart the purposes of God…Let every man and woman know, by the whisperings of the Spirit of God to themselves, whether their leaders are walking in the path the Lord dictates, or not” (63). “The colorful J. Gorden Kimball reminded his audience that “There are not enough Apostles in the Church to prevent us from thinking, and they are not disposed to do so; but some people fancy that because we have the Presidency and Apostles of the Church that they will do the thinking for us. There are men and women so mentally lazy that they hardly think for themselves. To think calls for effort, which makes some men tired and wearies their souls. No man or woman can remain in this Church on borrowed light” (63). “Nor did Joseph Smith claim to be holier than the people he led…Those who knew Joseph best loved and respected him, but they harbored no delusions about his flaws” (64-5). “’For unto this end have I raised you [Joseph] up, that I might show forth my wisdom through the weak things of the earth.’ The notion that modern prophets are infallible specimens of virtue and perfection is neither scriptural nor reasonable…Equally unreasonable is a view of published revelation as infallible, unerring transmission of the Divine voice” (67). “Airbrushing our leaders, past or present, is both a wrenching of the spiritual record and a form of idolatry. It generates an inaccurate paradigm that creates false expectations and disappointment” (70). “Authority is the source of delegation” (73). “As Henry Eyring once quoted his father as saying, ‘in this church you don’t have to believe anything that isn’t true’” (74). “No simple formula resolves the tensions that do—and should—exist between faith in the principle of inspired leadership and personal responsibility to follow counsel without stifling conscience. Elder Dallin Oaks made a related point: ‘As a General Authority, it is my responsibility to preach general principles. When I do, I don’t try to define all the exceptions…I only teach the general rules. Whether an exception applies to you is your responsibility. You must work that out individually between you and the Lord” (80). “Church resources are now being employed to explore and disseminate, rather than elide or suppress, a comprehensive history” (81). “Both Brigham Young and Lorenzo Snow imbibed Smith’s generous bend. Young preached, “Every faithful Methodist that has lived up to and faithfully fulfilled the requirements of his religion,…will have as great a heaven as he ever anticipated in the flesh, and far greater. Every Presbyterian, and every Quaker, and every Baptist, and every Roman Catholic Member… that lives according to the best light they heave,…will have and enjoy all they live for… This is the situation of Christendom after death. You may go among the Pagans, or among all the nations there are… and if they lived according to what they did possess, so they will receive hereafter. And will it be glory? You may inquire. Yes. Glory, glory, glory’” (92). “Over medication, over-programming, is a critically serious problem. The catch with overprescribing is the dependency it creates” (98). “As George McDonald wrote…’Sad, indeed, would the whole matter be, if the Bible told us everything God meant for us to believe’” (100). “Trials of faith seldom arise from core Mormon beliefs; few struggle with commitment because their God is too benevolent, His plan too generous, the heaven we anticipate too rich in relationships and love. Doctrines, however, no matter how pure, do not exist in a vacuum…And in the process, we occasionally find the pure gospel entangled with unfortunate ideas, pharisaical behavior, legalistic thinking, judgmentalism, and rules based more on tradition than inspiration…They are not the gospel itself. But the complaint that culture, not the gospel, is the problem, is not entirely satisfactory. Our experience with the gospel is inescapably mediated by, conditioned by, culture. We would suggest a more fruitful perspective” (103). “This is especialy true in the case of those who, harboring doubts or uncertainties, feel marginalized by Mormonism’s pervasive rhetoric of certainty” (104). [Letter to Givens] “I need to be honest with myself and others in a way that is positive…in the end I have come to one simple truth: we choose…I do not know that the Church is true. I do not know that there is a God but I hope there is….So I am content. But more importantly I feel free” (105). “Elder Jeffrey Holland, ‘I am not asking you to pretend to faith you do not have. I am asking you to be true to the faith you do have.’ It is important to recognize, as well, that hostility shown toward our doubts is often a sign of fear rather than intolerance” (106). “Love is the spark that fires across the chasm of difference, not the plane of sameness” (107). “[Norman Mailer] “If God is good, then He is not all powerful. If God is all powerful, then He is not all good. I am a disbeliever in the omnipotence of God because of the Holocaust. But for thirty-five years or so, I have been believing that He is doing the best He can” (111). “Those who have suffered tragedy, personally or vicariously, know that the sacrilege of glib consolation is worse than silence” (111)..”It is more helpful in such circumstances to validate real pain than to try to smooth it over” (112). “Surely God is not so fragile, so lacking in empathy, that He would take offense at our incredulity or our anger in the face of the world’s wounds. For our pain is already His…Suffering is for the loving” (115). [Mother Teresa] “this terrible sense of loss—this untold darkness—this loneliness—this continual longing for God—which gives me that pain deep down in my heart.—Darkness is such that I really do not see—neither with my mind or with my reason.—The place of God in my soul is blank.—There is no God in me.—When the pain of longing is so great—I just long and long for God and then it is that I feel—He does not want me—He is not there.--..God does not want me.—Sometimes—I just hear my own heart cry out—“my God” and nothing else comes. The torture and pain I cannot explain” (119). “It is also possible that God’s answers are sometimes too indirect, too oblique, for us to recognize because we are looking for something more palpable” (126). [Letter] “Enough of this nonsense. This is pure foolishness. Stop this at once. Stop praying with your knees, start praying with your feet”…”I’m just going to live my life as if the gospel is true” (128). [William James] “For my own part, I have also a horror of being duped; but I can believe that worse things than being duped may happen to a man in this world” (139). “’Cheerful insecurity’ was the name C.S. Lewis gave to this attitude of the Christian disciple. The question is, do we love what is true, what is good, what is beautiful, more than we fear the possible error our embrace of those things risks?” (139). “Even among his modern disciples, there would be—and must be—room for those who live in doubt. If our faith is damaged beyond repair of lacking altogether, if we cannot find it in ourselves to proclaim the gospel or embrace its tenets, we can still live its essence” (143). “The keyword is ‘active.’ They lived out their faith, even if they didn’t feel it” (144). Highly recommend. This book has been enormously helpful in finding reasons to continue in faith even when it feels impossible. I like how it asserts what is doctrine, what is policy, and what is culture. I loved the bit about how the Dark Ages weren't so dark after all and that when God does not have a prophet, He has a poet to speak for him. One need only look to the Old Testament to see this is true. It's helped me to have the courage to own my doubts and questions while knowing that they don' Highly recommend. This book has been enormously helpful in finding reasons to continue in faith even when it feels impossible. I like how it asserts what is doctrine, what is policy, and what is culture. I loved the bit about how the Dark Ages weren't so dark after all and that when God does not have a prophet, He has a poet to speak for him. One need only look to the Old Testament to see this is true. It's helped me to have the courage to own my doubts and questions while knowing that they don't have to mean the end of faith as I know it. It's OK to not have everything figured out. It's OK to not "know." I loved this book for so many reasons. 1. It challenged the way I looked at typical gospel subjects and themes - like the reason behind suffering, doubts, etc. 2. It was short and yet so compact with information that I could probably read it many times over. 3. I listened to the audiobook, which is narrated by the author, who happens to have a British accent. I think I might also read the print version, because it'd be easier to study that way. Terryl L. Givens was born in upstate New York, raised in the American southwest, and did his graduate work in Intellectual History (Cornell) and Comparative Literature (Ph.D. UNC Chapel Hill, 1988), working with Greek, German, Spanish, Portuguese, and English languages and literatures. As Professor of Literature and Religion, and the James A. Bostwick Professor of English at the University of Rich Terryl L. Givens was born in upstate New York, raised in the American southwest, and did his graduate work in Intellectual History (Cornell) and Comparative Literature (Ph.D. UNC Chapel Hill, 1988), working with Greek, German, Spanish, Portuguese, and English languages and literatures. As Professor of Literature and Religion, and the James A. Bostwick Professor of English at the University of Richmond, he teaches courses in Romanticism, nineteenth-century cultural studies, and the Bible and Literature. He has published in literary theory, British and European Romanticism, Mormon studies, and intellectual history.